Calling all you Football Fans this is a must have Prop. 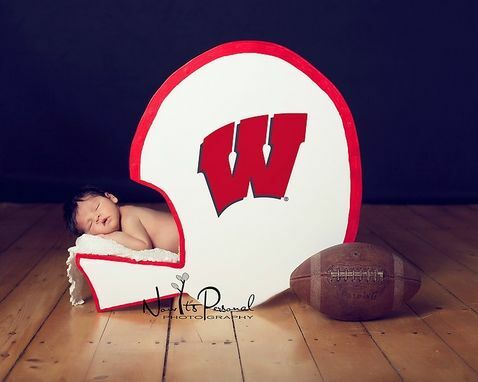 This Prop is perfect for those Future or Current Football Players. This is a Prop that will even get Macho Dad's excited about their newborns Photos. 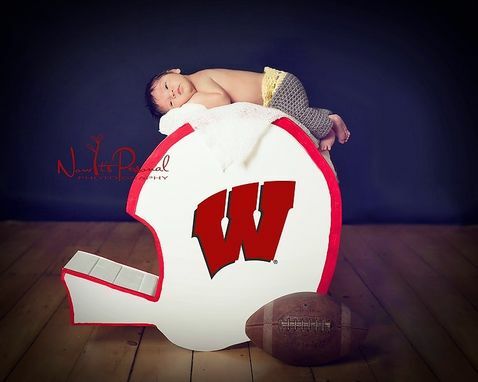 This would even be a great Prop for senior Photos or in a sports themed bedroom. This Solid wood Helmet can be customized in any color you would like to match your favorite team. All my products come fully assembled, painted, and ready to use. I ship all my products worldwide so if you are outside the US simply send me your full mailing address for a shipping quote. Thanks so much to Tanya @ Now it's Personal Photography for an amazing Photo!! !